Father of slain teen tells Arutz Sheva about 'complicated' dedication event, says last summer's unity will overcome. Arutz Sheva was on scene as a Torah scroll was dedicated Tuesday at the Kotel (Western Wall) in Jerusalem, in memory of the three Israeli teens abducted and murdered by Hamas terrorists last summer - Eyal Yifrah (19), Gilad Sha'ar (16) and Naftali Frenkel (16). The families of the murdered teens were present at the special event, as were Chief Ashkenazic Rabbi David Lau, Chief Sephardic Rabbi Yitzhak Yosef, Kotel Chief Rabbi Shmuel Rabinowitz, and other leading rabbis. 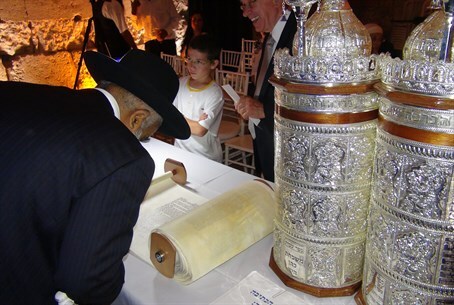 Gilad Sha'ar's father Ofir spoke to Arutz Sheva about the Torah dedication, calling it a "complicated event" in that it is both a memorial to the murdered teens encompassing the pain of their loss, but it also contains the joy of dedicating a Torah scroll at the Kotel. "The symbol of the three boys was the unity of kol am Yisrael (the entire nation of Israel - ed.) all this year and especially all the time of the kidnapping," said the bereaved father. "The most special place to show this unity is here in the Kotel, where everyone can feel belonging here in this place." When asked whether the murder of the boys sparked a change in Israeli society, he noted that there is a tendency for one news story to replace another and the public to become indifferent. But at the same time, Sha'ar said he perceived that people last summer felt "not the same," in a change for unity he hopes can continue in the coming years.